Guinea-Bissau's capital is reported to be calm with traffic returning to the streets, just a day after a military coup. Soldiers have been heading back to their barracks and the international airport is expected to reopen soon. New military leader, General Verissimo Correia Seabre, says he will remain leader until elections are organised in Guinea-Bissau. A delegation of West African foreign ministers led by the head of the regional grouping, Ecowas, is expected to hold talks with the coup leader later on Monday. 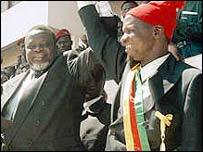 The general was also holding talks with political parties and other groups in Guinea-Bissau. Several African countries including Nigeria, Senegal and South Africa, as well as the United Nations and Portugal, have condemned the coup. 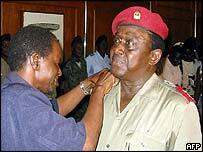 But there is said to be relief among many ordinary people in Bissau that President Kumba Yala is gone where he was often criticised for his erratic leadership. The military authorities say the meetings are part of efforts to establish a transitional, civilian-led government. But in a telephone call with the president of neighbouring Senegal, the army chief of staff was urged to hand power back to the country's elected president. President Abdoulaye Wade said that the African Union would not recognise whatever government General Seabre planned to install and asked them to "devolve power back to President Kumba Yala". An army communique said the deposed president would be transferred on Monday from Bissau's main army barracks to his private residence. President Yalla dissolved the government last November, promising new elections but they have been postponed four times since. The coup came at dawn on Sunday, following an announcement on Saturday that the president would have to cancel them again. Radio stations broadcast a message from the army saying it had seized power because President Yalla had failed to resolve the country's problems. "I am going to assume the presidency of the republic until there are elections," General Correia told Portuguese state television. "As a person, I have nothing against Kumba Yalla," he said. "He can stay in Guinea-Bissau as well as leave the country." No shots were reported to have been fired. The secretary general of the United Nations said in June that the country was embarking on a downward course. "The coup leaders have asked people to stay at home during the day"
"We have an absolutely normal Monday...a very normal Monday."